I know it seems like a real assholic thing to say. Mother’s Day is my second favorite holiday of the year. I’m uncharacteristically sentimental about it. For me it celebrates both a milestone in my coming self discovery as well as a continued effort and bag of mixed achievements and pseudo-failures. 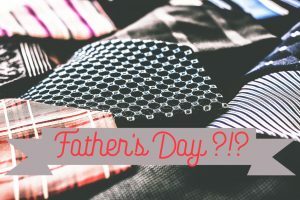 So why can’t I appreciate the same for Father’s Day? It’s about the inequality of the thing – at a societal level. Sure – for me, becoming a mother involved growing life inside of me, forever changing me physically, and then tearing it from my body is an equally forceful and also graceful means (and many come into motherhood differently and have different, equally powerful experiences) so for him – and I’m speaking of my babies’ daddy, it’s more like – oh, congratulations for ejaculating inside your wife’s body. But I don’t think that’s true and, while it does make me chuckle a bit, it isn’t why I think Father’s Day is a crock. On Mother’s Day there’s a celebration of all the I do as a mother and, at least in my house, it’s largely declared as my day off from the parts of mothering that can be draining. Everyone else does my chores, I don’t have to play the part of the great arbitrator, I guiltlessly run or go to the gym, I take naps, I may or may not shave certain body parts… I get hugs and everyone basks in gratitude. My family shows their thanks for things I do by rallying together to do it for me… and I routinely thank my children for making me a mother. But Father’s Day doesn’t really seem like it reciprocates so much as it’s offered as a payback for Mother’s Day. I don’t take on his chores. I do mine. Again. As usual or with more emphasis. But he wasn’t going to make himself breakfast anyway. It kind of makes the gifts of bother Mother’s Day AND fathers feel more transactional and less appreciative. On or around Mother’s Day the kids make stuff for us and then we go to school and get some tea and celebrate with them. It can be a bit mind numbing but I get it. On Father’s Day, our kids’ school sent a note that said “because you work so hard we wouldn’t want to make you take time out of your busy schedule to be with your kids so just take a cup of coffee and a donut in the morning.” Wait. What? That’s it. That’s what bothers me. The thing is, my kids’ dad is a great dad. He hangs out with them, changes diapers, goes to doctors appointments, takes them to dinner, handles everything when I’m out of town without even remotely complaining. In fact he’s probably a better dad than I am a mom. But he’s a terrible mom. That’s largely because the standard for dads is exceptionally low whereas the standard for mothers is irrationally high but the expectations for dads to handle things that enable good parenting – career, home care, maintenance etc – is irrationally high leaving little room for many dads to find balance and build deep personal relationships and bonding with their children. What fathers need more than another breakfast or steak dinner or ugly tie or mug with their kids handprints on them … is paternity leave. It’s time to spend without external pressure so that they can be with and fully experience and embody the ontology of being a father. They don’t need a day off from fathering. They need a day off from distractions to fathering. And that’s just not how we set this “holiday” up. So let’s hear it dads… if this holiday were truly a celebration of you and fatherhood, what would you want it to entail? What would make it your new favorite holiday of the year?